Here's a view I'd rather crop out. The inside of the rolltop desk is a minefield of paper, cords, and shipping supplies. I'd like to keep the top open for a rotating display of library books. Cleaning it is my project for the day! Here's the before-and-after breakfast room corner. Oh boy, one thing on my to-do list is cleaning out my desk which is very similar to that... Only, I think I'd straighten mine up a little bit before I took the before picture... Yes, it's that bad. I fear to open it for avalanches. Roll top desks are so pretty, but they have a weakness for becoming catch-alls. 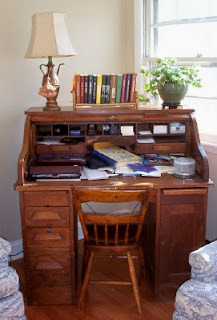 Your roll top desk - has pride of place - justified by it's beauty and importance.